It is common knowledge that Paris is an ideal tourist destination for people seeking a pleasurable and stress free vacation. The city has numerous attractions that can be enjoyed by couples, singles, families, and groups. Simply put, the city has exciting attractions for everybody’s enjoyment. Paris is famed for its numerous museums and more so for its iconic Eiffel Tower, which is regarded as the precious pearl or biggest treasure of Paris and it is also listed among the Seven Wonders of the World. The Eiffel Tower has been in existence for the past 125 years and it has received over 250 million visitors to date. The tower was not always as famous as it is today. Matter of fact, in its early years, it was likened to a giant and disgraceful skeleton. Clearly, the ancients did not have a good taste for artwork. Today, the monument is not only adored by the locals but also attracts tourists to the city. The Eiffel tower was designed by one Gustave Eiffel and it was constructed to mark the 100 year anniversary of the great French revolution. The tower symbolized the height of Belle Epoque, which is a period of great peace, optimism and progress. I had heard a lot of interesting stories about the Eiffel tower and I then decided that it was about time I got to engage in some tourism. I contacted one of the local tour companies in my country and got myself a good tour package for two. This was to be my second visit to Paris; the first one was on a business trip and I did not have much time to explore and discover the various attractions that the city of love had to offer. So, I gathered that Paris would be a great destination for 5 days vacation. On arrival in Paris, we checked into a hotel overlooking the Eiffel tower. We strolled to the Eiffel tower and got a chance to walk up the marble steps making our way to the wide esplanade. A walk further up brought us to the historic balcony where the UN adopted its declaration Universal Declaration of Human Rights. This balcony overlooks Place du Trocadéro and its many fountains. 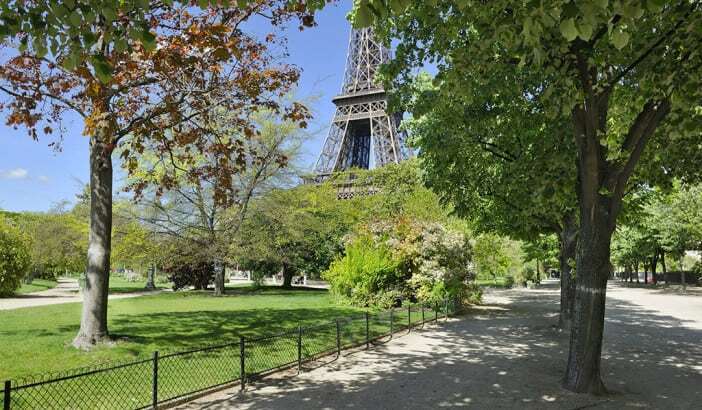 The Trocadéro gardens located below the tower is renowned for its romantic path dubbed Lover’s lane. We crossed over Pont d’Iena and made our way into the 7th arrondissement which opens into the towers entrance. To accentuate the experience, we opted not to take the direct elevator. Instead, we chose to ascend the first two levels of the tower by stairs. This was advantageous because it allowed us a chance to enjoy the scenic beauty of the tower’s surroundings while at the same time saving us some money. Further, catching the direct elevator is a real hustle because of the long queues of tourists that wish to make it to the top. We also got to take some of our best pictures climbing the stairs to the second level of the tower. The 674 spiraling stairs’ climb was a nice and memorable accomplishment. We got a chance to take some cool pictures showing the view of le Palais de Chaillot from level two of the tower. The gusty winds blowing up there necessitated that we wear our sweaters. Our tour guide told us that the winds are always there no matter the time of the year. So we had done well heeding his advice to carry a sweater. We finally caught an elevator to the top of the tower. Paris looked beautiful from this view point. The sun had begun to set and we could see it as it descended down the horizons. The distant lights from the city beneath brought out the romantic look and feel that is synonymous with Paris. On the last day we spent some quality time picnicking at the Champ de Mars located below the tower. Locals and foreigners alike gather here to enjoy themselves. The macaroni pizza and sparkling with sparkling wine was an excellent snack for the picnic. The 5 day vacation was really fun and I came back feeling so refreshed ready to get back to my demanding job. I will make a point of revisiting the Eiffel Tower the next time we are in Paris.